What really makes an expensive affair like Motorsports tick in any country? Is it loads and loads of money, or just supreme talent that cruises past social hurdles and economic impediments in an almost unstoppable way? Looking at the growth of motorsports in India over its brief formative period, we have come to realize that lack of awareness, insufficient funding and more than anything else, a sold infrastructure for the promotion and nurturing of talent at grassroot levels is what finally makes for a promising future for aspiring drivers, who with their passion and relentless hard work will someday evolve into competitors on a global scale. With the wrap on the spectacular inaugural season of the Volkswagen Polo Cup, and more importantly with the coveted Formula One Championship making its debut in India later this year, we certainly seem to be going ahead in full throttle. But, our sudden surge in the field of motorsport has been bolstered by a number of local and national karting championships, one of the most recognized being the Amaron Karting Challenge, which now having completed it third successful edition has made it to the FIA Calendar along with the VW Polo Cup, and laid the foundations for youngsters in India to pursue their passion for racing. 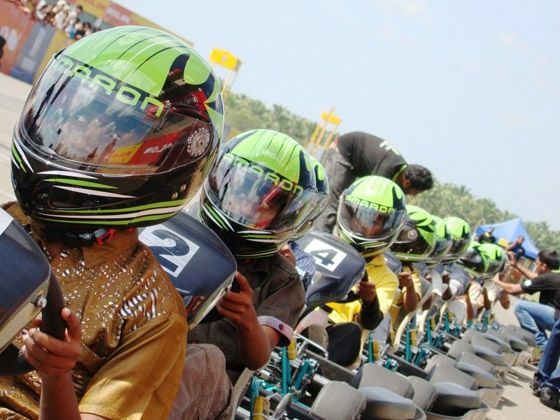 Conducted between November 2010 and February 2011, Season 3 of the Amaron Karting Challenge spanned 9 cities in the country. The first race of the season in Coimbatore (20-21 Nov’10) was a fantastic start to the championship bringing in record participants. The second round in Chennai (4-5 Dec’10) was re-scheduled to the 18-19th of December due to rain. Being the hub of local and national motorsport activities in the country, the re-scheduled Chennai race saw record participation and some brilliant driving spectacles. The third round in Bengaluru (11-12 Dec’10) at the TorQ-03 Karting circuit carried forward the same theme of introducing youngsters from Bangalore to the world of competitive motorsport. The same overwhelming response was carried over at all the preceding race venues, which covered strategic locations like Kolhapur, Mumbai, Goa, Delhi and Chandigarh. The final regional race and the national finals were held at the newly built Meco’s Ministry of Speed (MMS) – JK Tyre Kart Track in Hyderabad (04, 05 & 06 Feb '11), which is one of the finest tracks for competitive karting in the country today. Bangalore boys dominated the event with Akash Gowda, Akhil Rabindra and Prahkyat Rai sweeping the podium in first, second and third place respectively. In doing so, Akash Gowda won the Amaron Karting Challenge Season 3 Championship title and bagged a scholarship worth Rs.10 lakh, which includes professional training and covers expenses for various racing-related events. The top finishers of AKC 3 will also be participating in the final round of the 2011 Volkswagen Polo Cup. Through its flagship Amaron Karting Challenge, Amaron Pro Racing continues to provide the perfect platform to youngsters in India, to excel at what they do best and someday dream of racing on an international grid.